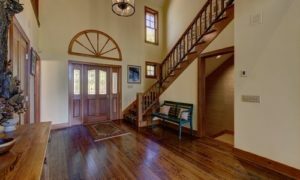 Flooring matters in Highlands NC homes. A floor is so much more than place for your feet to stand on. In many ways the floor is a home’s biggest fashion statement. From tile and linoleum to hardwoods and carpet, the choices for flooring are endless. The choice you make can add great impact visually. When it comes time to list a Highlands NC home for sale flooring can also make a huge impact on would-be buyers. While flooring trends change over time buyer certain options appear to be timeless. Hardwood flooring is a great example. There are so many types wood available, cherry, walnut, oak and pine to name few. Additionally there are many widths and colors. Furthermore a homeowner can opt for maintenance free wood look by choosing tile or linoleum with a wood look and texture. Flooring choices for Highlands NC homes might come down to the inhabitants of the home. Pets and children, for example, may require more durable surfaces. Knowing your needs and what will be required for upkeep is helpful when choosing the type of floors that wildest suit your home or specific rooms in your home. Contact our team at Berkshire Hathaway HomeServices Meadows Mountain Realty today to learn more about Highlands NC real estate. We welcome the opportunity to update you on current home trends while filling you in on market conditions. Let our knowledge and experience serve as your guide to Highlands NC homes. Click here to read “Why Good Flooring is Critical For New Home Buyers” from Realty Times.